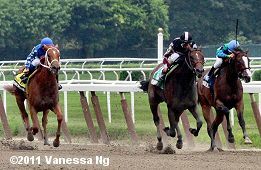 Belmont Park hosted four stakes races on the Sunday before Independence Day. Just 4,964 fans were on hand on a showery afternoon with temperatures in the high 70's. The feature race was the $150,000 Futurity Stakes (G2) for 2-year-olds sprinting 6 furlongs on the main track. Tarpy's Goal was sent off as the 8-5 favorite in the field of 6 off a maiden win in his debut. 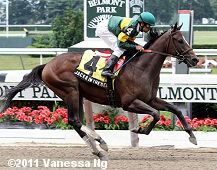 In to challenge him included 3-1 second choice Getupwiththesun, a maiden winner at Pimlico last out, and 7-2 third choice Team Six, off his debut win at Monmouth. Jockey John Velazquez sent Team Six to the lead soon after the start and he set early fractions of 22.97 and 47.18 while as many as 1 1/2 lengths in front of Tarpy's Goal and 14-1 Jack's in the Deck stalking him second and third. Team Six continued to lead to mid-stretch through 5/8 in 1:00.09, but Jack's in the Deck easily passed him inside the 1/8 pole and drew off to win by 4 lengths in 1:13.36 over the fast track. It was just a nose back to favorite Tarpy's Goal third. 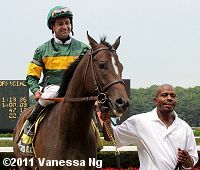 Left: Jack's in the Deck in the winner's circle. 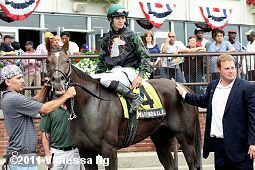 His trainer Robin Graham said, "We've been trying to get him into maiden races at Delaware Park, because he's Delaware-certified, but the races haven't filled. He's been getting better as he's trained, and we all felt like going longer would be better for him. It worked out perfect. There was a lot of speed in there. I thought at the top of the stretch he was in good shape. I know he likes running at horses, so that was great." Right: Jack's in the Deck in the post parade. 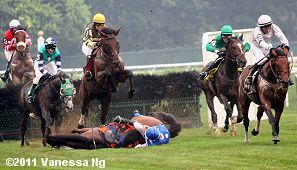 His jockey Joe Bravo said, "I didn't get too dirty! I really didn't know what to expect. The horse showed some talent his first time out, but the minute the race started he showed me that he had these horses today and he looks like he's got a good future ahead of him." Left: Second place finisher Team Six returns after the race. 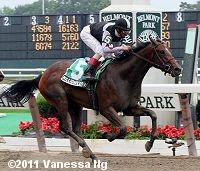 The 7-2 third choice set the early pace under jockey John Velazquez but tired late to finish second beaten 4 lengths. The Mark Shuman trainee improved his record to 1 win and 1 second in 2 starts, earning $57,000 for owner Joseph Strazzanti. Right: Third place finisher Tarpy's Goal in the post parade. 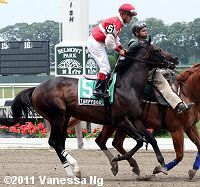 The 8-5 favorite stalked the pace 3 lengths back under jockey Javier Castellano, was wide on the turn and finished third but beaten a nose for second. The Dale Romans trainee improved his record to 1 win and 1 third in 2 starts, earning $39,240 for owner Mike Tarp. The distaff counterpart to the Futurity is the $150,000 Matron Stakes (G2) for 3-year-old fillies also sprinting 6 furlongs. 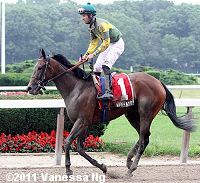 Defy Gravity was the 8-5 favorite in the field of 6 off her maiden victory, over 2-1 second choice Hook It Up, a debut winner last out, and 7-2 third choice Say a Novena, winner of a maiden event in her second start. Say a Novena battled for the early lead with 11-1 longest shot Dancing Anna through fractions of 22.84 and 46.75 over the fast track. Say a Novena led to mid-stretch through 5/8 in 59.28, but 7-1 Millionreasonswhy, last early, closed late, passing the pacesetter inside the 1/8 pole to win going away by 2 lengths in 1:12.68. 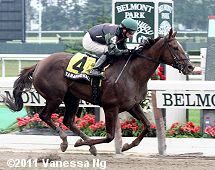 It was another 2 1/4 lengths back to Dancing Anna third, while favorite Defy Gravity was 5th. 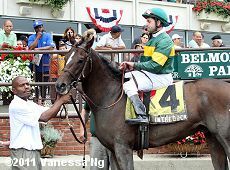 Left: Millionreasonswhy in the winner's circle. 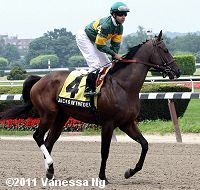 Her trainer Ignacio Correas IV said, "She wants longer. We always thought she was good. We chose to run her at Colonial to give her some experience. We knew that she had talent. She had a really bad break but she won anyway. 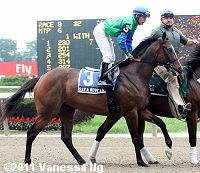 You cannot ask for a horse to do better than she did in her first start, so why not give her a shot. 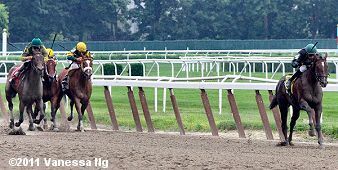 We'll look at Saratoga; she will take us there." 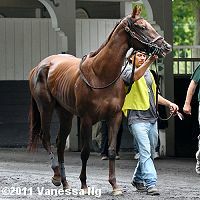 Right: Millionreasonswhy returns after the race. Her jockey John Velazquez said, "I broke out of there and they came out a little, but I pointed right to the inside and they came right back inside of me. I was kind of clipping heels so I said 'You know what, I'm going to take the safe way. I'm going to go to the outside.' And it happened that (Hook It Up) stopped, I went right to the clear where it was a safe ride, and I didn't have to check on her. It actually worked out very well. I think she'll go further - very nice." Right: Millionreasonswhy heads back to the barn. Left: Second place finisher Say a Novena in the post parade. The 7-2 third choice set the pace under jockey Mike Luzzi but could not contain the winner. The Edward Plesa Jr. trainee improved her record to 1 win, 1 second, and 0 thirds in 3 starts, earning $59,250 for owner Rick Stanley. Left: Third place finisher Dancing Anna returns after the race. 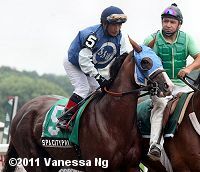 The 11-1 longest shot pressed the pace under jockey Jose Betancourt but tired late to finish 3rd beaten 4 1/4 lengths. The daughter of Cuvee improved her record to 1 win, 1 second, and 1 third in 3 starts, earning $50,100 for owner-trainer John Robb. Right: Fifth place finisher and beaten favorite Defy Gravity in the post parade. The 9-5 favorite stalked the pace 3 wide under jockey Wesley Ho, then tired into the stretch and faded to finish 5th beaten 11 3/4 lengths. 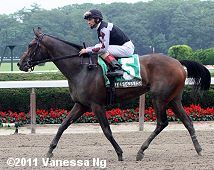 The Valora Testerman trainee has a record of 1 win and 1 third in 3 starts, earning $24,900 for owner Roland Reeley. The last stakes race on Sunday was the $150,000 Bed O'Roses Handicap (G3) for older fillies and mares sprinting 7 furlongs on the main track. 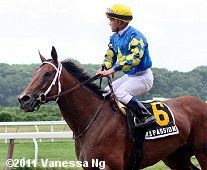 Vagrancy (G2) winner Hilda's Passion was sent off as the 2-5 favorite in the field of 7 over 5-1 Christine Daae, an allowance winner at Gulfstream last out, and 11-1 Curlina, runner-up in the Vagrancy. Curlina battled for the lead with Hilda's Passion down the backstretch through fractions of 22.62 and 45.55 while being stalked by 16-1 Tamarind Hall. Entering the stretch, the pacesetters tired as Tamarind Hall inherited the lead and opened up by 6 in mid-stretch through 3/4 in 1:10.10. 23-1 Kid Kate put in a late rally but Tamarind Hall cruised under the line 5 1/4 lengths in front in 1:23.82. It was another 3/4 length back to 26-1 longest shot Spa City Princess third, while favorite Hilda's Passion was 6th. 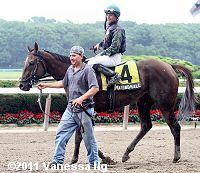 Left: Tamarind Hall in the winner's circle. Right: Tamarind Hall returns after the race. 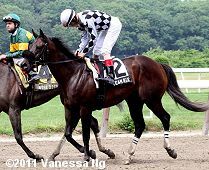 Her trainer Jeremiah Englehart said, "Ever since I got her back to Finger Lakes, she's just been a different horse from the winter. She's just been powerful. In her last race she ran a real big number, and she came out of it just as good. Everything she does, she does like it's a walk in the park. I was a little nervous after she broke in front and we took back and I didn't think we'd be able to make it up. It looked like around the turn that David was still pretty confident. Once he asked her to go through the hole, she just exploded." 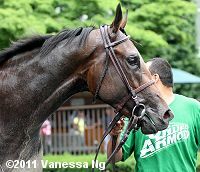 Left: Tamarind Hall in the paddock before the race. 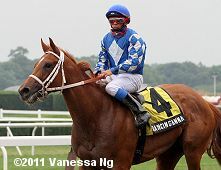 Her jockey David Cohen said, "In the post parade, she was so strong, on game. Whatever I was, 15-1, she didn't give me that feeling; really a strong horse. I could have moved at any time. There was a nice gap between Javier and Ramon on the turn, and I kind of got her into that to get her part of the race and put her into position. When I asked her to go into that hole, she just responded where I didn't want to take anything away from her. She went right through it, and opened by 3, 4, 5 lengths within jumps. I just let her be happy and let her do her thing." Right: Second place finisher Kid Kate returns after the race. The 23-1 shot raced midpack 4th early under jockey Eddie Castro, then passed tired horses to get second beaten 5 1/4 lengths. 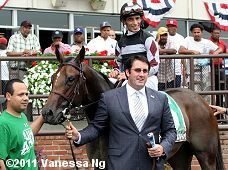 The Chad Brown trainee improved her record to 5 wins, 3 seconds, and 3 thirds in 15 starts, earning $280,429 for owner-breeder Dell Ridge Farm. Left: Third place finisher Spa City Princess in the post parade. The 26-1 longest shot raced in last early under jockey Jorge Chavez, then rallied late to get third beaten 6 lengths. The Pat Kelly trainee improved her record to 5 wins, 0 seconds and 3 thirds in 14 starts, earning $206,559 for owner-breeder Adam Madkour. Right: Sixth place finisher and beaten favorite Hilda's Passion returns after the race. The 2-5 favorite pressed the pace 3 wide under jockey Javier Castellano but tired on the turn to finish 6th beaten 12 1/4 lengths. The Todd Pletcher trainee has a record of 7 wins, 2 seconds, and 0 thirds in 13 starts, earning $589,493 for owners Starlight Racing and Charles Glasscock. The first race on Sunday was the $50,000 William Entenmann Novice Hurdle for older horses going 2 1/4 miles over national fences. All Together was the 2-1 favorite in the field of 9 over 7-2 Complete Zen and 4-1 Good Request. 11-1 Lake Placid and 40-1 Slaney Rock battled for the early lead most of the way in the tightly bunched field. 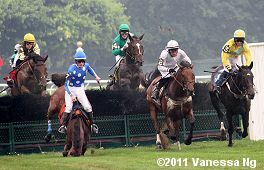 On the far turn, Lake Placid tired as Slaney Rock led to the second last jump. However, at that fence he fell, as 10-1 Demonstrative took over after that jump and drew off to win by 7 lengths over 6-1 One Giant Step in 4:03.25 over the firm turf. It was another 3 1/4 lengths back to favorite All Together third. 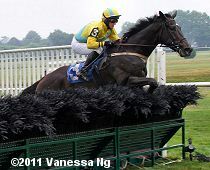 Slaney Rock and his rider Bernard Dalton, who fell over the 10th fence, both appeared to be OK following the incident. 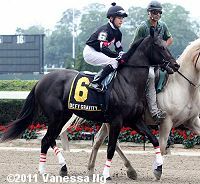 Dalton, who stood and walked off the course under his own power, was evaluated, treated and released by NYRA First Aid. 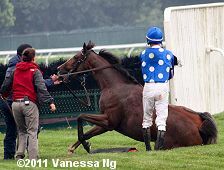 Slaney Rock was stabilized on the track and then walked onto the horse ambulance and was vanned back to the stable area. 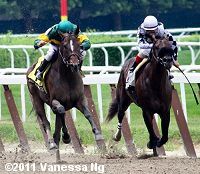 Eventual winner Demonstrative (#3) is on the far right of the first phoro and One Giant Step (#1) who went on to finish second is leaping over the fallen horse in the middle photo.